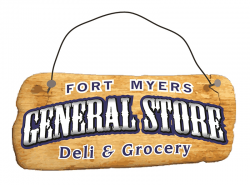 Fort Myers General Store is a convenience store and deli located in the Downtown Fort Myers Historic District. The 3000 square foot store sells Beer, Wine, Tobacco, Lottery, Coffee, Cold Drinks, and Grocery Items. The store boasts a premium deli, which sells subs, sandwiches, soups, wraps, and a new line of deli meats which are all natural and uncured. The store is ideally located to serve the community, right next to the Fort Myers Regional Library.